In 1975 a race was born in the muddy waters of Davis, West Virginia. Dave Coombs, owner of the famed GNCC racing series, was contacted by a small-town preacher in West Virginia regarding the economy of his struggling town. He was interested in hosting a motorcycle race to bring money into the area. Coombs saw the enormous potential, and the Blackwater 100 was born! The Blackwater race was aptly named after nearby Blackwater Falls and Blackwater River. This 100-mile race was so popular that a Bally pinball machine was made to showcase its legendary status. Unfortunately, 1993 would end the reign of America’s toughest race because of the high level of toxins found in the water by the power company that owned the land. The legend remains in the minds of the youngsters who are now adults and the racers that attended the race in its glory days. The mighty Honda TRX250R dominated the ATV side of the Blackwater 100. McGill wanted to build a machine that even the average Joe could afford to do on their own. He used a stock frame gusseted by RJR, added Custom Axis spring shocks and long-travel LoneStar Racing A-arms. Everything on the TRX led to a budget-minded build. Adam wanted to build Davis into a machine that an average racer could build himself, with a few exceptions. Adam found a clean stock frame without cracks or breaks and had an RJR gusset kit welded in to make it last for the long haul. Out back is a stock Honda Pro-Link swingarm, stock linkage and a fully adjustable Custom Axis shock. Again, Adam made the stopping power incredible by having a custom brake stay for a TRX450R rear caliper. Some of the parts might be tough to obtain for a 250R. Adam’s Davis has a TRX450R front end on it. You read that right—Lonestar Racing built long-travel A-arms similar to Adam’s TRX450R so that he could run the dual-piston 450R brake calipers and have more precise turning with the 2005 style geometry. The arms are +2 wider and +1 forward over OEM for a more stable machine in corners and on long straightaways. Even with this added width, Davis didn’t have any issues squeaking through tree sections. Adam also had a custom rear caliper brake stay built to accommodate a TRX450R rear brake caliper for better stopping power than was available in 1988. Custom Axis fully adjustable shocks suspend Davis front and rear and bring modern suspension performance. The Flexx handlebar helps cut out the arm pump and blisters of the two-hour races that Adam subjects it to. They also help cut down vibration from the two-stroke. 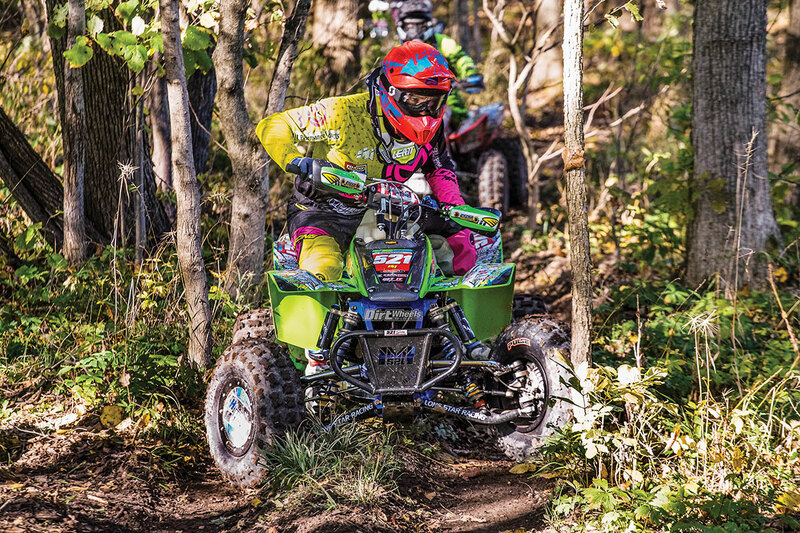 The Cycra handguards are a must for woods racers, so they don’t hurt their hands while navigating the tree sections. Rage Racing built a very reliable 265cc powerplant that produces great power and a broad powerband. They bored the stock cylinder, added an oversized Wiseco piston, ported the cylinder and added some Rage tricks that make this machine move quickly. An engine setup like this was typical of championship winners from the 1980s through the early 2000s. The full FMF exhaust provides a crisp sound and helps with the low-end pull. Another trick is adding a full ignition from the CR250 two-stroke dirt bike to provide more low-end magic that helps it pull out of the corners quickly. RJR made this one-off peg and heel-guard setup for McGill. With two-strokes making a strong come back, we hope that companies like RJR start making production runs of these. The stainless steel pegs kept our feet planted even in the mud. Protecting the engine is a dual-stage Twin Air air filter. Rage Racing also tuned the Keihin carburetor to perfection. Along with the piston, a Wiseco clutch kit and clutch basket were installed for longevity and better clutch feel. Maier recently redesigned its 250R plastics, making a deeper depression for the starter to sit in. We like these plastics, as they fit well and provide great coverage. 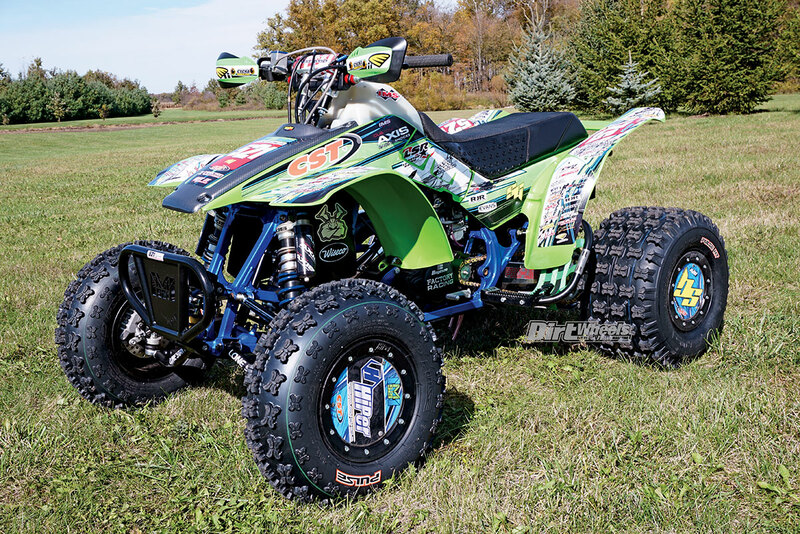 Spider Graphix created a replica of Adam’s TRX450R graphics kit to work on Davis’ plastic. RJR builds some impressive aluminum parts, and Adam has his own line with RJR, and his “McGill Mafia 521” logo is cut into the front of the bumper. Other not-so-attainable parts are the one-off footpegs and heel guards that RJR built for this machine. The pegs are made from stainless steel, and they provide excellent boot grip. The heel guards are wide and offer a net instead of metal. 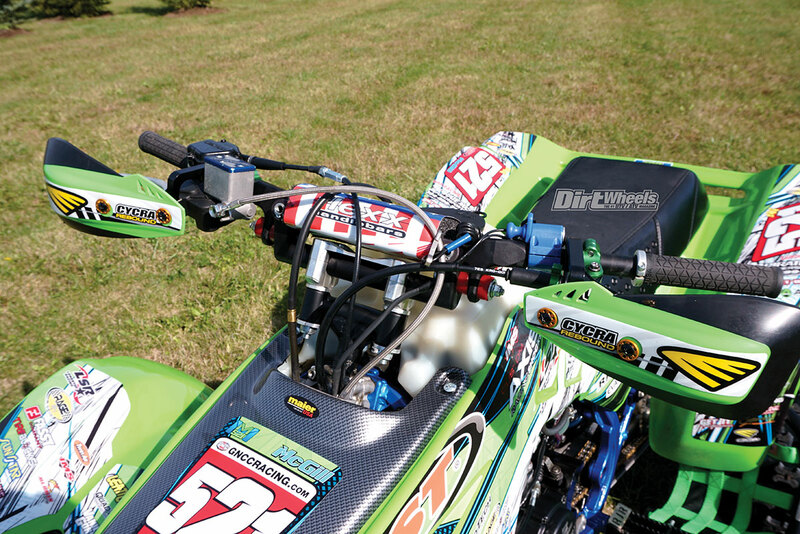 The RJR grab bar is built for racers with tabs to mount a rear number plate. Adam runs the same CST Pulse tires on his TRX450R that are on Davis. 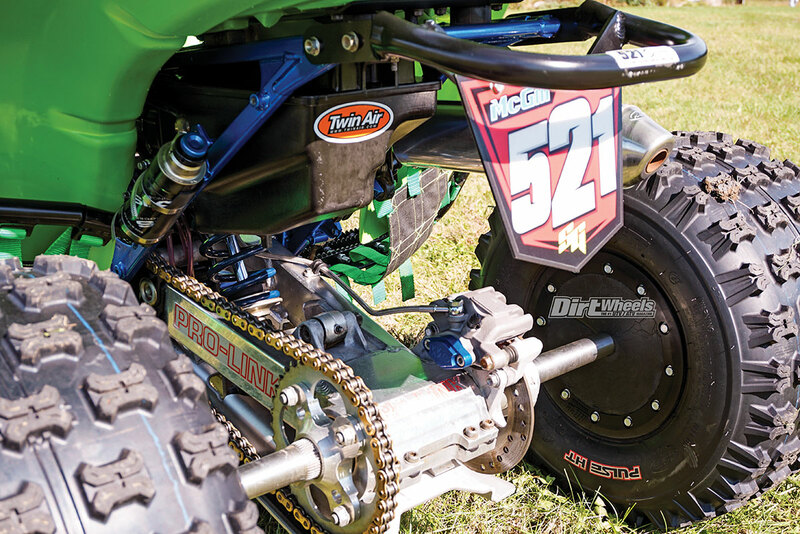 The 21-inch front and 20-inch rear tires are the best setup for XC racing, and the six-ply design makes for a strong carcass against punctures. If he does get a puncture, the TireBlocks will allow him to finish the race. 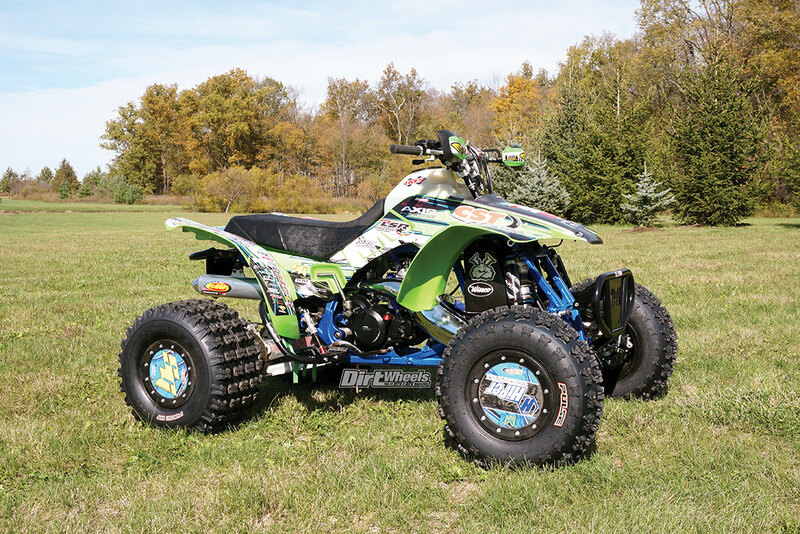 CST Pulse six-ply 21-inch front tires and 20-inch rear tires provide great traction, are lightweight and are a perfect tire setup for GNCC. The Pulse tires are riding on some trick carbon fiber wheels from Hiper that are not only lightweight but are stronger than heck! Inside this great package Adam runs TireBlocks’ flat prevention system for a couple of reasons. Number one: He can finish a race even if he punctures a tire. Number two: You can run lower tire pressures with TireBlocks, which means more traction. The Precision steering stabilizer isn’t something that was around when a 250R like Davis would’ve been raced, but racers back then would’ve loved one. 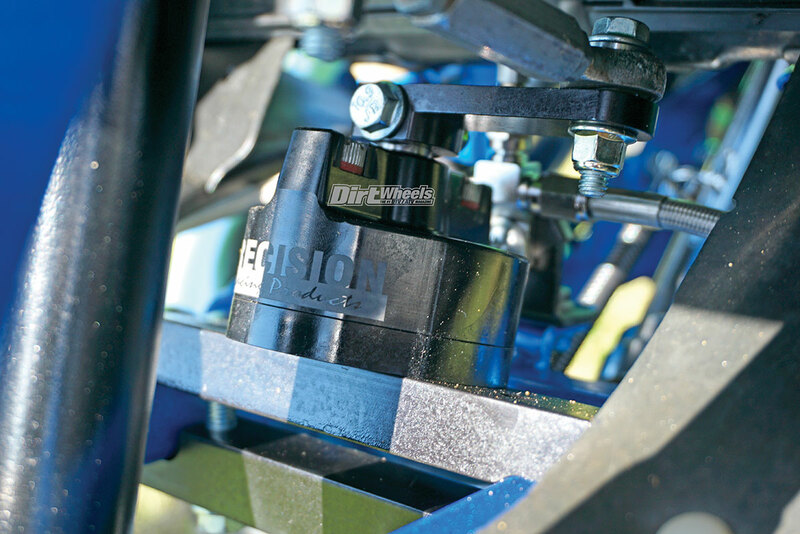 Precision’s stabilizer takes the impacts out of the steering and dampens the blow. Trust us, you should have one if you’re racing a quad. We were able to ride Davis on the Meyers’ property where the Ironman GNCC is held. With a small moto turn track and a woods section, we could stretch this 250R’s legs in many different situations. The first thing that caught our attention was how well the Rage 265cc engine ran. It was a perfect combination of all-out fun, perfectly tuned power and it was extremely easy to ride throughout the powerband. Having a crisp-running two-stroke is a dream, and we were living it while riding Davis! It might be tough to see, but this TRX250R has a TRX450R LSR front end on it, complete with 450R dual-piston brake calipers, which is a huge improvement for these mighty machines. The LSR A-arms are +2 wide and +1 forward for better stability. Even at this width it fits fine in the woods. The suspension package was impressing us more and more each lap. Whether it was the woods sections or the open moto-style field section, it provided stability and an extremely smooth ride no matter what rugged terrain we subjected Davis to. Cornering Davis was a delight and surprisingly easy to get in and out of a corner quickly. It didn’t feel like it had a stock frame at all. It felt more like a Laeger or a LoneStar Racing chassis. 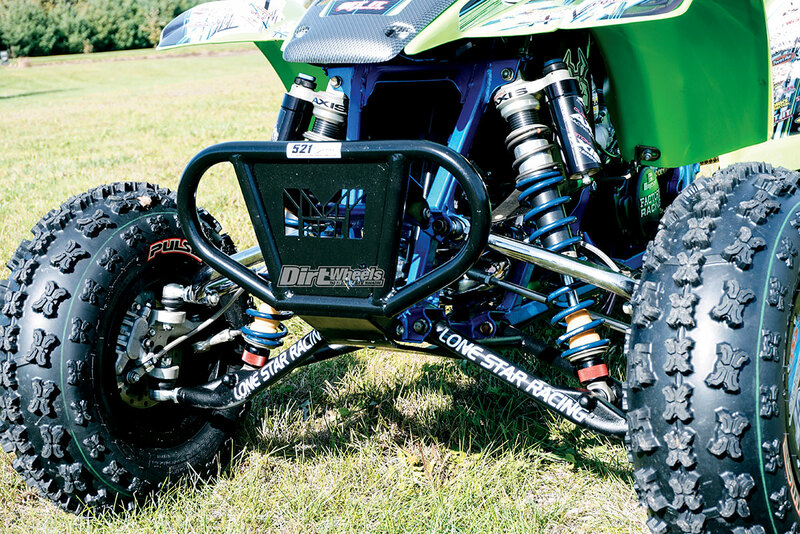 We attribute that to the 2005 TRX450R front-end geometry and, again, how well the Custom Axis shocks were dialed in. The biggest change from any other 250R was the brakes—that impressed us the most. 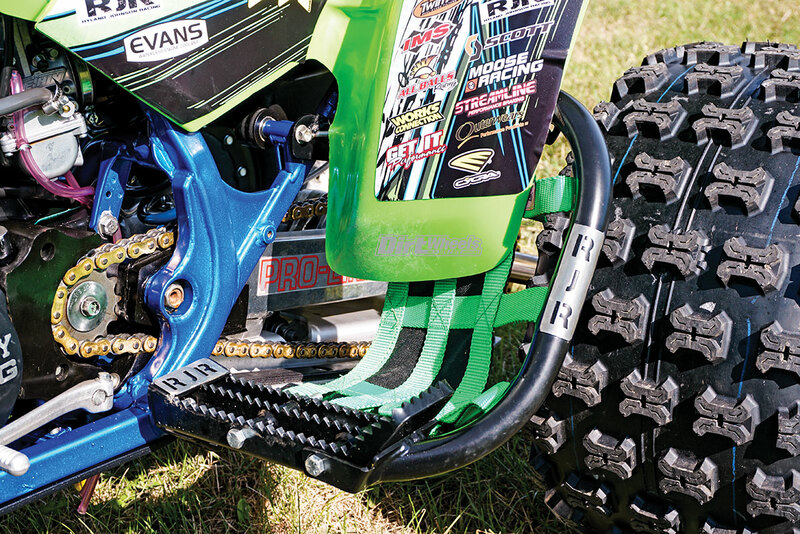 The 450R brakes feel firm and give the 250R unrivaled stopping power. 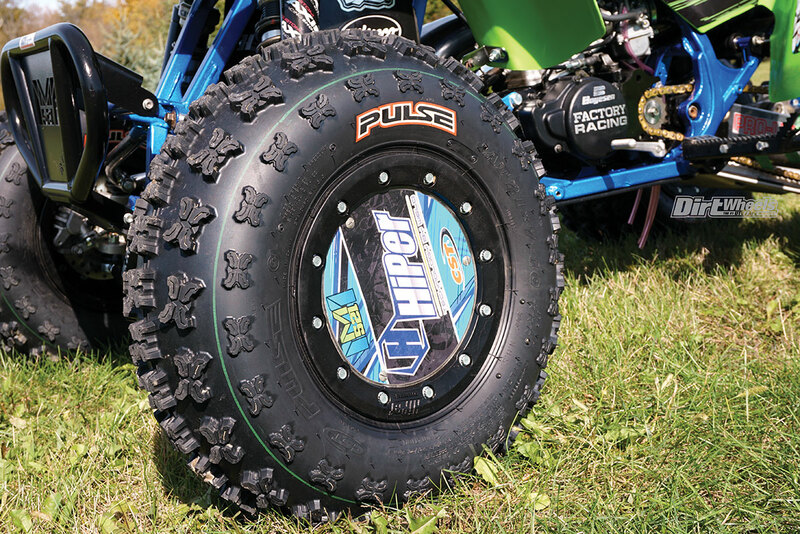 The CST Pulse tires never disappoint when it comes to traction. They provide great side bite when cornering, but not so much that Davis wanted to put us on our heads. It made it even better that we were able to run low air pressure with the TireBlocks to get greater traction from the Pulse tires. We can see why this is what McGill, aka “The Gator,” uses in the swamps of GNCC racing! Like usual, Adam nailed it when it came to sculpting a 250R that an average rider could build. Now we know there are some parts that might be inaccessible that are on this build, but using some of the parts mentioned in this build could get you a solid and fun machine that you could be confident riding anywhere in the U.S. Sometimes it doesn’t take a huge checkbook to make something special like Davis; it just takes some know-how, heart, dedication and having a lot of fun building it to make it work. Riding it afterwards is just the cherry on top!